Welcome to our Ischia blog, Good Morning Ischia! Here you can see the entry for Thursday 30th January 2014. My mini-break away from Ischia continues so today's blog is another very brief update. 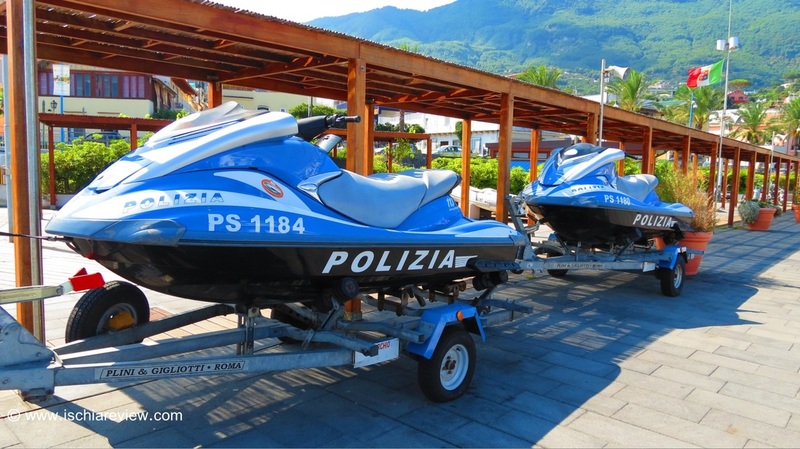 Today I've chosen one of my favourite photos that I've taken of the island, these fantastic police jet-skis in Casamicciola. This isn't quite "Baywatch" or "Miami Vice" territory and considering Ischia has an almost non-existent crime-rate I can only assume the purchase of these machines came out of some surplus annual budget or from a water-sport loving procurement manager, either way they look like great fun! Ok that's all from me today, having a great holiday but looking forward to getting back to the magic of Ischia at the weekend. Don't be shy if you've got any questions about the island, drop me a line with whatever you need to know and I'll get back to you ASAP.